Can we machshir the hai of shem without a shailas tinok, or must ask a tinok first, since it resembles a ches? He says the Tav is a shailos tinnuk. One because it almost looks like a gimmel and 2 because there needs to be a "space" under the gag. He drew me 2 pictures one where the 2 legs of the Tav come to a point in the middle of the gag and look like an upside down "V" the other where the gag was written normally then a regel coming down and then another regel going out from that corner on an angle. He said he doesn't think this picture fits that problem so much. L'maseh a tinnuk should be asked. In regards to the Hei he said one can see cleary that the regel is not touching and looks like a hei. He said he wouldn't require a Shailos tinnuk, kosher as it is. I think that after the tinok read the tav correctly, one is obligated to scrape out and hollow the challal of the tav. In regard to the hai I think a shaylas tinok is required, it does resemble a ches. In other letters/situations a slight break like that is permitted to be fixed. example: the regel of dalet disconnected abit from gag as long as a tinok will recognize it is permitted to fix shlo csidran in tefilin. So for a ches of rashi this might be a (permitted to fix) ches?! I agree with you in regards to the Tav. In terms of the Hei...I hear what you're saying. Even though I do disagree with R' Shammai at times here in this shailo (b'clal in this inyun) I go with whatever he says. I spoke to him in the past about fixing such a ches. He said it's a shailos tinnuk because of the other way that maybe it looks like a hei! He didn't mention this but perhaps something would be different here because we are dealing with a Shem? "B'dieved even a very small chalal should be ok. It really would depend though, as long as there is still tzuros haois. A very small dot as the chalal however wouldn't be kosher." Yehoshua I didn't understand: "I spoke to him .. about fixing such a ches. He said it's a shailos tinnuk because of the other way that maybe it looks like a hei!" This is exactly what I'm saying: since this is a problematic tzura for ches, it is equaly problematic for the hei! Just as the ches separated slightly may be a hei, a hei separated slightly may be a ches. We are at the grey area in between hai and ches that should be defined by a tinok. What is the "essence" of the tzurah of the hei. More domeh to a ches that is seperated or a daled with a yud. Could be also he holds the shailo really starts only when it's mamash close and not niker l'hedia that it's not connected. 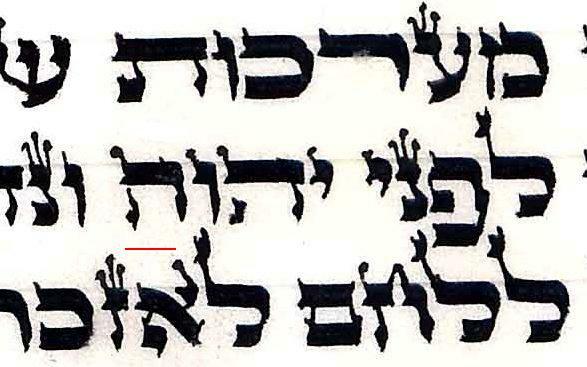 In regards to the ה, see the mikdash maat sif katan 16 where when there is a hefsek of cichut hasarah (here it looks a little more than that)to the gag, it is kosher and the wording is "... shmistama tinok yakir..."
Implying that it is not necessary to ask a tinok in this case when it is assumed he will answer correctly. Dovid, please read the mikdash me'at once again - maybe you might see my point there? Well it seemed to me that the regel is separated enough not to mix it up with a ches,(at least from a large screen,) maybe in person especially from an amah away it is not the case. My point was that it is not the most severe closeness to the gag since it seems more than a chut hasarah separation, but again the big screen can throw off the true metzios.